I posted awhile ago about the purse I made for the Its My Bag Swap. Well, this is the one I received in return. 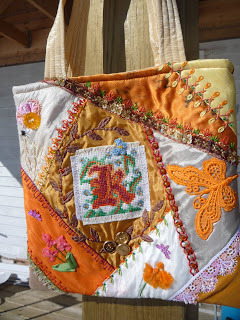 It was Pauline who received the baggie I sent and I think she did very well with the colours. Orange can be a challenge! lol There are some really lovely seams on this bag and I am very pleased with the way it turned out. Well, my weekend company left and I put my nose to the grindstone today and pieced the last three wedges for my Christmas tree skirt for the Xmas RR. I managed to incorporate some more of the items I've been saving - another hankie, more pieces of thread painted and metallic embroidery cushions, linens and lace. 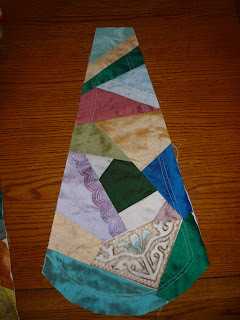 Other than that they are again pieced almost entirely from dupioni silk. It looks quite nice and I can't wait to see it as it progresses around. It will be in the mail tomorrow, a week late, which is about typical for me. Now I need to be on the lookout for Leslie's project arriving here - I can't wait to see it! I'm preparing blocks for a Christmas Round Robin starting up. We're making this round robin for larger than usual projects with a slower than usual turn around on the blocks. We'll have two months to work on each before sending them on. 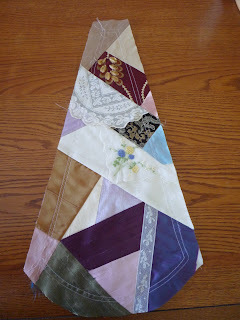 I decided that my project would be a small tree skirt, made up Dresden plate style of 14 wedges. 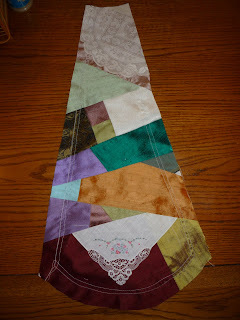 Seven wedges will be crazy quilted and the other seven will be solid - perhaps black velvet? - and the two types will alternate. 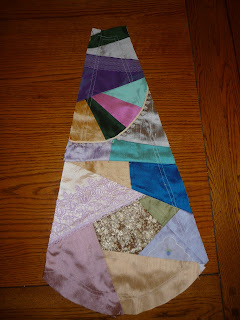 These are the first four which I finished piecing today. I have three more to go but with company coming for the weekend I will likely not get them done until Monday. I was really feeling like I was on a roll with these so it may be hard to resist finishing them up. 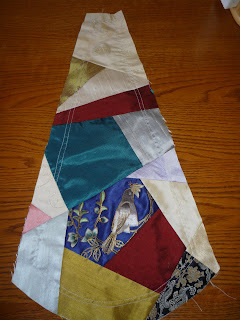 I had intended to go with Christmas colours but once I dug out all my silks I found they just had a mind of their own! 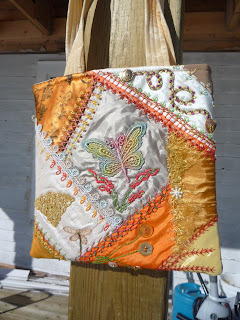 I also enjoyed adding a few extras in the way of hand dyed laces, embroidered handkerchiefs and some silk and metal hand embroidery from a decorative cushion. I'm looking forward to getting started on this round robin. I will post pictures of the final three wedges when I have them done as well. Look what the postman brought me! A gorgeous pinkeep made by Lyn. To win one of these treasures you need to check out the teasers at the start of each month on Lyn's blog. There is a quiz each month on a actress from one of Lyn's vintage silkies. It is a lot of fun to take part as well as being very interesting! And, of course, the bonus is when you win something delightful like this pinkeep! Thank you Lyn - I will treasure this forever. The tree is so gorgeou, with several million stitches I think. This might just be too pretty to use! 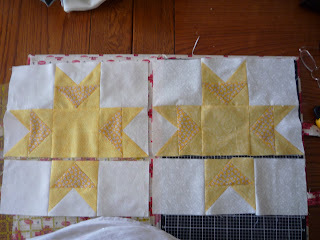 Well, I have my five blocks done for the March Block Lottery early this month! You can see them here as well as the secondary pattern they form. The block is called Arrowhead Puzzle. 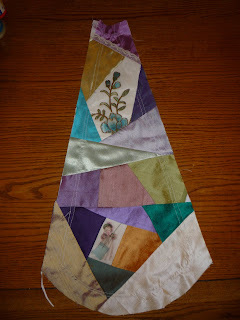 It is another 12" block from The Quilters Cache. I really enjoyed this one and would like to make something from it someday. It is a good beginner block - vouched for by this beginner! 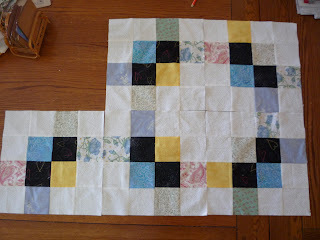 All 3-1/2" squares - the black patches and the white patches are the same in each block - the others were done in choices of scraps and it made it interesting. Now I'll have to keep my fingers crossed to win the lottery! Well, I followed through so far on my plan to do the free Block of the Month, Harmony Village, and I even decided to double up on them so I would hopefully end up with two quilt tops at the end. How's that for ambitious?! Here is the first block anyway and I need to get the second one done up as well before the 3rd one is posted around the middle of March. Then I'll be all caught up. 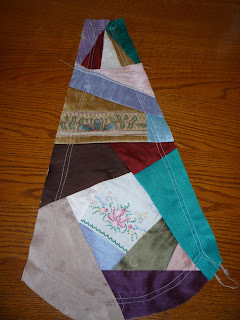 I love the idea of it being made up of scraps and odd bits! 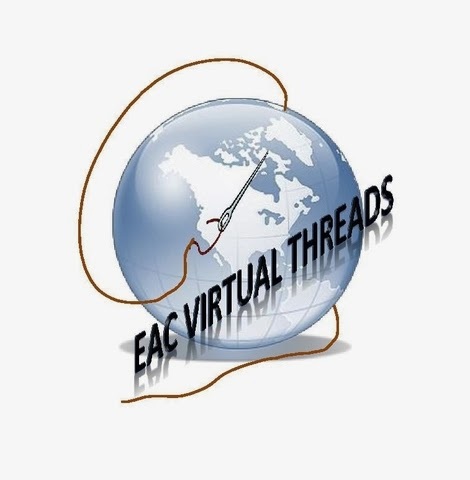 Nice to start a big project without having to go out and spend a small fortune on fabric. Recently I had the opportunity to stitch an Under the Sea block for my friend, Lyn. I jumped at the chance to do a block at my own pace without any deadlines as there are in round robins. So, here it is! 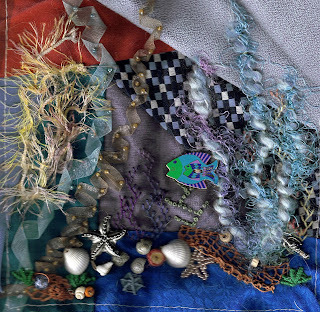 There is a fair bit of seaweed growth made by attaching organza ribbon with beads and couching down some knitting yarns with interesting texture. There is also some feather stitch plant growth but a lot of it disappeared into the background. I made some netting with detached buttonhole stitch and was pleased to find wooden beads to attach that I thought looked just like the old cork floats that would be used on fishnet. 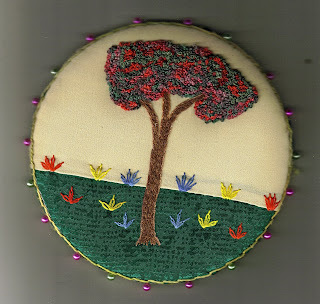 Other than that there is a bit of this and that sewn on - shells and charms, a beaded starfish, a few little plant like growths and lastly - how could a resist a Laurel Birch fish button? lol I hope Lyn likes this block - I had a lot of fun stitching it! It will be heading away in the mail on Monday. 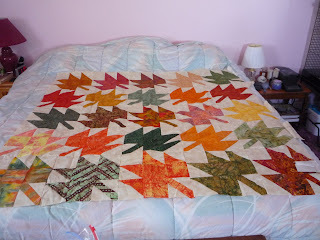 It was pretty exciting this last week to have my quilt top come home completed from the Row by Row robin. As you can see it turned out beautifully! All of the leaves are pieced in batiks. I think I may add another row in length and width to make it large enough for this bed which is a king size. I am very happy with how it turned out. Many thanks to all the ladies who were involved in this Row Robin with me! 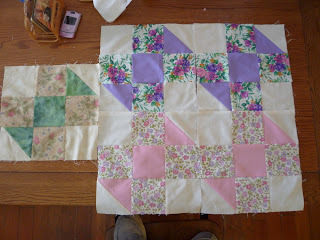 This is the last of the quilt tops I got to work on in the Row Robin. 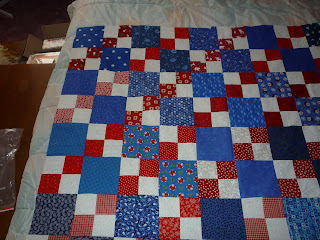 This one is a patriotic modified four patch and belongs to Cathy. It was fun to work on and a bit of a relief after some of the more challenging blocks that have been in this row robin. I think it turned out really nicely though! It is in the mail on its way home to Cathy now. The block lottery for February was an hourglass block - these above are the ones I did for the draw. The lucky winner of this lottery will be receiving 41 blocks in the mail - that should b e enough to make a great quilt! Lots of fun and good practice making the different blocks. Congratulations Pam! I drew a name from everyone who commented on my post about embossing velvet and your name came out of the hat. 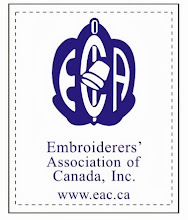 So, I have just packaged up a couple pieces of the embossed velvet I did and will pop it in the mail to you. Have fun with it!